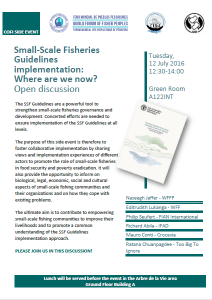 Small-Scale Fisheries Guidelines implementation: Where are we now? The SSF Guidelines are a powerful tool to strengthen SSF governance and development and concerted efforts are needed to ensure implementation of the SSF Guidelines at all levels. In July, TBTI Project Director Ratana Chuenpagdee was invited to speak at a side event at COFI 32, at a meeting that specifically focused on the implementation of the SSF Guidelines. The purpose of this side event was to foster collaborative implementation by sharing views and implementation experiences of different actors to promote the role of SSF in food security and poverty eradication. It was also the opportunity to inform on biological, legal, economic, social and cultural aspects of small-scale fishing communities and their organizations and on how they cope with existing problems. 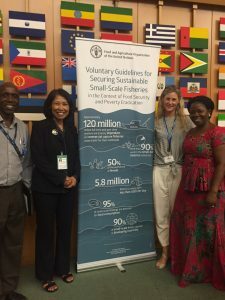 The ultimate aim was to contribute to empowering small-scale fishing communities to improve their livelihoods and to promote a common understanding of the SSF Guidelines implementation approach. The event was organized by the World Forum of Fisher Peoples (WFFP), World Forum of Fish Harvesters & Fish Workers (WFF) and The International Collective in Support of Fishworkers (ICSF).